Brilliant flowers and contrasting lime green foliage make Heuchera Little Cutie Sweet Tart a standout plant in a shaded position. 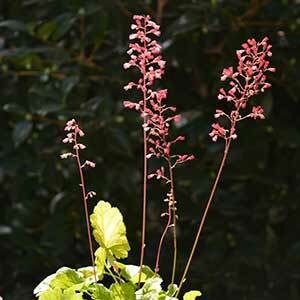 This Heuchera hybrid is an evergreen perennial with the flowers rising above the foliage on tall stems. Foliage is nicely scalloped. Use Heuchera Little Cutie Sweet Tart to give a year round lift to a shaded position. The lime green foliage year round adds interest while the cherry red flowers are a highlight in late summer. Also suited to growing at the front of the garden border or in containers where it can be used to underplant taller shrubs. Use it in the cooler part of the rock garden as a feature. Also suited for mass planting where it can be used to line a pathway in a shaded area. A humus rich moist soil best, along with good drainage. A position in dappled shade with protection from frosts is best. Mulch around plants to maintain a cool moist root run. Fertilise with a liquid seaweed fertiliser in spring and again in early summer. Top dress with wet rotted compost and aged manure each spring to promote strong growth. Spent flower heads can be trimmed back if desired. Position – Dappled shade to part sun. Climate – Cool to temperate. Heuchera Little Cutie Sweet Tart is available for sale from the following participating nurseries.